LANDR has landed on your desktop. If you've got a Mac, that is. Auto-mastering service LANDR has announced that it's introducing a free desktop app for Mac users, adding new workflow features in the process. Previously, it had to be accessed from your web browser. Thanks to the new app, you can now drag-n-drop entire folders of tracks for bulk mastering, and all mastered tracks are backed up in the cloud. There are other user experience improvements, too, such as the option to compare mastered and unmastered tracks. There's a further bonus for users of Studio One 3 and Bitwig Studio: these DAWs will integrate with LANDR (supposedly seamlessly) for instant mastering of finished tracks. Integration with INgrooves, TuneCore and CD Baby is also on the agenda. Commenting on the new app, LANDR CEO Pascal Pilon said: "Our goal at LANDR is to make it easy for musicians to get the sound they are looking for without needing to learn complex audio tools. With this app, we're very excited to introduce that vision directly into musician's DAW's where our mastering is integrated into the process of creating music. 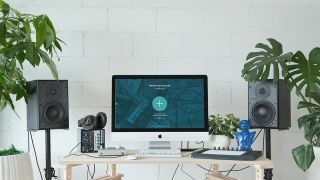 With our bulk uploading features we hope to offer busy audio professionals a much easier workflow that gives them the great sound they are used to from LANDR, much faster." PreSonus President and Chief Strategy Officer Jim Odom, meanwhile, had this to say: "We are excited to integrate with LANDR in Studio One 3. LANDR will be a terrific mastering solution for Studio One users who want a quick, professional sounding master. Not only does the platform sound good, but it's a great tool to use in the final mixing stages. I think this will be a great solution for our Studio One customers." You can sign up for a subscription and download the app on the LANDR website.